also a thick trace; so check the out. E.	Wire U7 pin 2 to U7 pin 4. F.	Wire U7 pin 5 to U7 pin 9. G.	Wire U7 pin 6 to U7 pins 13 and	12. H.	Wire U7 pin 10 to U7 pin 14 (+5V). I. U7 pin 11 should be hooked to U27 pin 5 from step E of adding U27 above. Double check your wiring. It should now match the schematic in Fig. 4. If it does, install the EPROM that has software for RAM at 8000 hex, and try out your board. If everything is working, the TNC should operate as if unmodified. If not, recheck your wiring for mistakes. Your board now has the RAM relocated to 8000 hex which will provide a lot of address space for the new EPROM added in the next step. Since there are only four EPROM sockets, the TNC is severely limited in how much software can be run. I feel that if a separate processor is used to generate and receive packets, it should be able to run most all of the networking overhead, not just the link level. The four 2708 EPROMs are just about full with only a bare-bones version of the link-level software, so there is no room left for the actual network software or anything above that level. This mod will allow the use of 2716 or 2732 EPROMs instead of the 2708s being used. This will change the maximum EPROM capability from the present 4k to 8k (42716) or 16k (4-2732). An added feature of this mod is that the minus 5-volt power supply is no longer used, and can be eliminated. 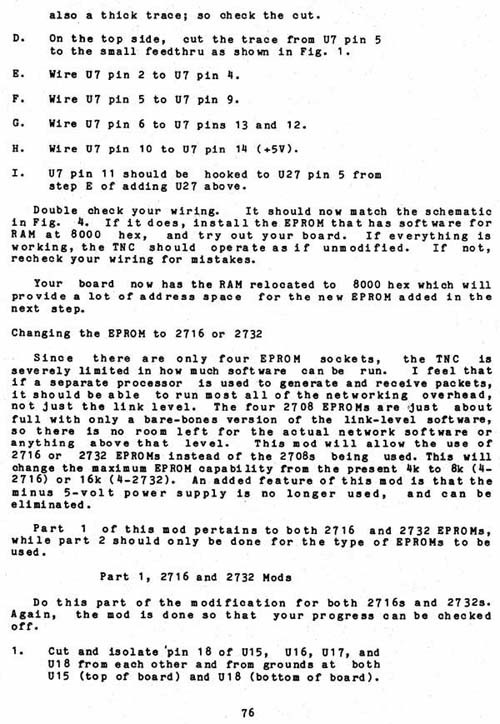 Part 1 of this mod pertains to both 2716 and 2732 EPROMS, while part 2 should only be done for the type of EPROMs to be used . Do this part of the modification for both 2716s and 2732s. Again, the mod is done so that your progress can be checked off. 1. Cut and isolate pin 18 of U15, U16, U17, and U18 from each other and from grounds at both U15 (top of board)	and U18 (bottom of board).